You can earn 60 Tuner Miles on this product! Safeguard your high-flow air filter without sacrificing performance. 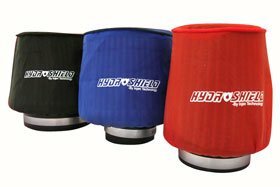 Injen’s nearly water proof Hydro Shield repels water and other microscopic debris while still maintaining smooth airflow. Available in Red and Black. Lifetime Warranty. Does not include air filter. Does not fit the Injen intake system for the Factory Turbocharged Cobalt (SP7027).